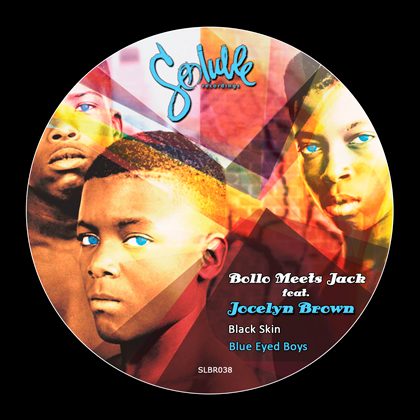 We are very proud to announce a new uplifting house release Black Skin Blue Eyed Boys by Soluble Recordings label boss Bollo. He teamed up with German producer Jürgen Müller aka Jack, who asked him to remake the original tune by British pop rock group The Equals – from early 70’s. The vocal part has been provided by an American vocalist, who has worked with some of the most talented musicians, producers, super performers, radio and television presenters and most of the best of all the DJ’s in the world. Ladies and gentleman, this vocalist is no one else but the queen of house music, Jocelyn Brown herself! The result of this collaboration is a classic house track that carries an important message. The message of humanity that is so very important in our times, marked by globalization and continuation of violent conflicts, to bring people of various cultures and political ideals together as one united global heart and mind. Let the music support this message, and help to focus on our mutual desire to serve, create and manifest true peace on earth while transcending our differences and celebrating our common humanity.